Maybelline Fit Me! Matte + Poreless foundation review! Hey guys! Happy July! I've heard alot about the Maybelline fit me foundations. I decided to try out the Matte + Poreless line of the foundation because it was the only one I could get my hands on. It's quite popular and I've heard mixed reviews about it. My regular foundation is the Revlon Colorstay foundation which I reviewed HERE so I was excited to try a dewy foundation for the first time. Once I opened this foundation, I discovered that it didn't come with a pump! Was I surprised? No. Most drugstore foundations don't come with a pump so getting the right amount of product out isn't so easybut I really don't mind since it's so inexpensive. Upon application, the foundation applies easily and smoothly on the face without looking uneven. It is very light weight and does not feel cakey at all. 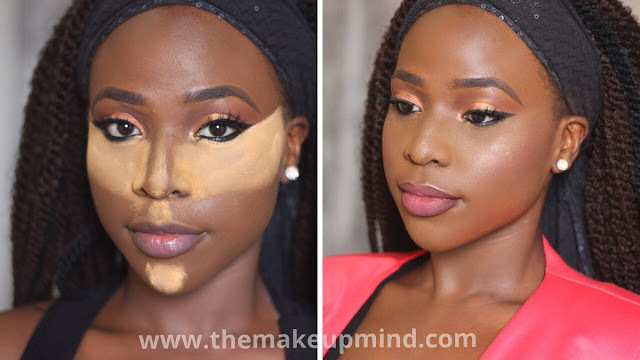 It's a light to medium coverage foundation. If you're looking for a foundation to cover up your flaws and all, this is not your guy. This foundation lets your skin shine through. Therefore having a more natural look. It does not feel heavy and it feels quite comfortable. It actually looks dewy and fresh. That's one thing I like about it. To be honest, I see more bad than good in this foundation. It just doesn't give me that flawless look I like after applying foundation. It smoothes out the skin but compared to the Revlon colorstay foundation that I use often, it's just not it! One major problem I have is the fact that the foundation line doesn't have a variety of shades for dark skin tones. The darkest shade is the 'coconut' shade that I have and it's a little bit lighter than my skin tone so I have to tone it down with my face powder and a bronzer. Another disadvantage is that it does not last long. After about 6 hours, it begins to fade away. I advise using a face primer before applying the foundation for longer wear. I only advise using this foundation if you don't have problems with your skin, you're looking for a lightweight foundation and you want a foundation that is inexpensive. Other than these reasons, I don't see any need to get this foundation.